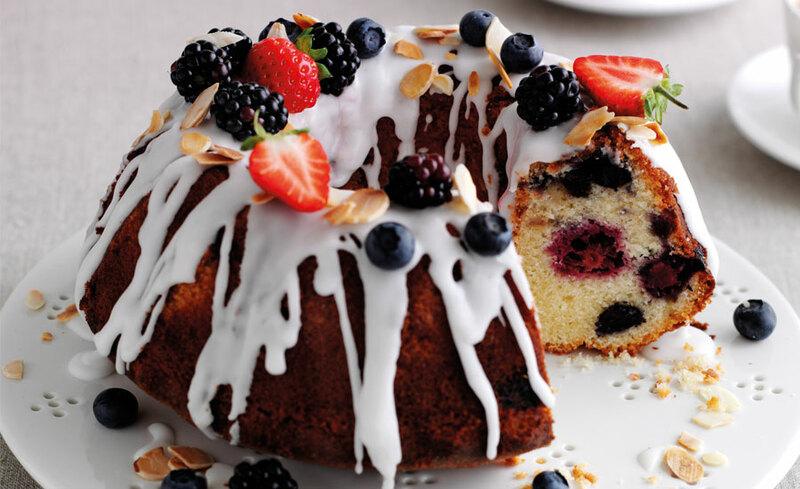 If you’re not a fan of heavy dried fruit cakes then try this light almondy sponge cake speckled with blackberries and blueberries drizzled with glace icing. This is a lighter alternative to a traditional cake and will need to be eaten in a couple of days as it is made using fresh ingredients. It can be frozen before being decorated if you want to make it ahead of time. Preheat the oven to 180C/350F/Gas Mark 4. Brush inside a 23cm (9 inch) diameter or 1.5 litre (3 pint) fluted ring mould with a little oil. Add the blackberries and blueberries to a small bowl with 2 tablespoons of the flour and gently stir together until the berries are coated. Add baking powder to the remaining flour. 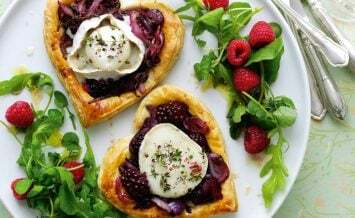 Cream the butter and sugar together in a large bowl with a wooden spoon or electric mixer until light and fluffy. Gradually mix in alternate spoonfuls of beaten egg and remaining flour, beating well after each addition and continuing until both have all been added. Stir in the ground almonds and almond essence if using, then fold in the flour coated berries. Spoon the mixture into the cake tin and level the top. Bake for 40-50 minutes or until well risen, the top is golden and a skewer comes out cleanly when inserted into the cake. Leave to cool for 30 minutes then loosen the edges of the mould, turn out on to a wire rack and remove the mould. Leave to cool completely. At this point the cake can be frozen. Sift the icing sugar into a bowl, gradually mix in just enough water to mix to a smooth icing that will slowly fall from a spoon. 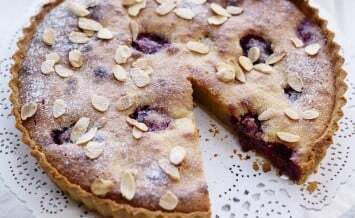 Transfer the cake to a serving plate, drizzle the icing over in zig zag lines, decorate with a few extra berries and sprinkle with the flaked almonds. Leave to stand for 15 minutes or so for the icing to set, then cut into thick slices and serve. Tip: As the cake has lots of fresh fruit in the mixture it is best eaten within 2 days.